My Hubby has started a new hobby...wood turning and I couldn't be happier. I am quickly accumulating beauties like the piece below which is made out of birch (he harvests wind-fallen birch and spruce trees from the forest behind the house). He used to teach college level hand thrown pottery, so I'm guessing some of those skills have carried over to his new wood turning attempts. In any case, I am very happy with the results. 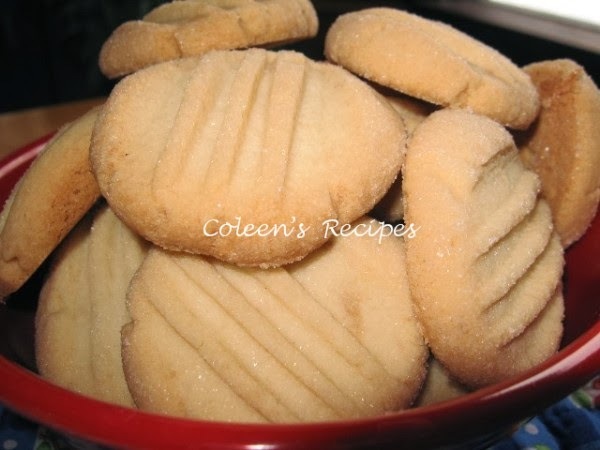 Today's Shortbread Meltaway Cookies are quick, easy and they literally do, melt in your mouth. Cream the butter, in a stand mixer, until smooth. Add the rest of the ingredients and beat until the dough is well mixed and comes away from the sides of the bowl. Roll dough into one inch balls and roll them in sugar. Place on ungreased cookie sheet and lightly press down with a fork. Bake at 350F for 10 to 12 minutes or until the outside edges of the cookie start to turn golden. Makes about 3 dozen cookies. NOTE: You won't taste the coconut extract, but it adds a little something extra that REALLY improves the overall taste of the cookie. Buckets! I think they look like buckets! And I love them, I'll take one! :D forgot to look at the cookies but the picture was yummy. ohhh you should sell them on your site..beautiful! And the cookies don't look too shabby either! Meltaway cookies you say..look awesome and taste that way too I'm sure! Your hubby did some wonderful work with that wood! Oh, yum...nothing like a wonderful shortbread that just melts in your mouth! That wooden piece is beautiful! What a talented duo you two make! You can cook and he can turn wood! What a gorgeous bowl! I love the wood grains in it too! It is just so pretty! I'm sure you will find lots of things to do with it. Awesome! I bought wood a while back to make bowls and never did. Maybe this will inspire me. Wonderful woodwork to match the wonderful cookies. Thanks to both of you. Well good for him , it's a very good hobby and he is quiet good at it. Love your shortbread cookies! Wow, what a great hobby your husband has, awesome work. 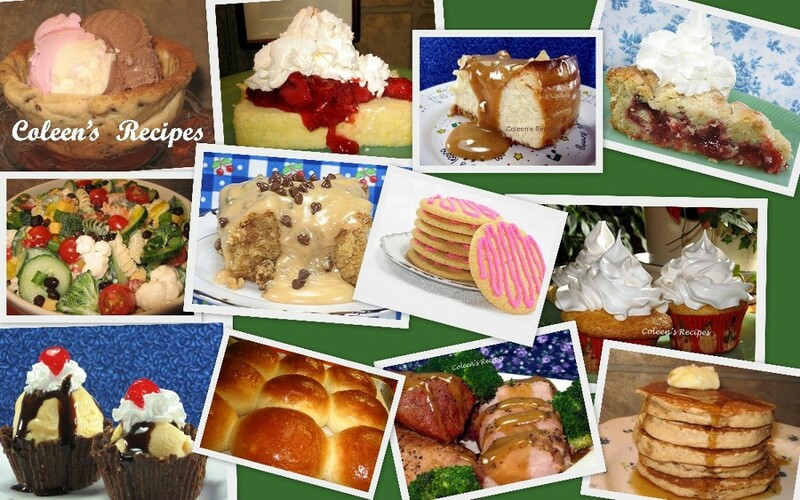 Yummm..meltaway cookies so good and made with ingredients I have on hand. I could eat them by the handfuls (and I do!). Wow, that birch "pretty" is pretty special. How nice to have a husband who is such a fine craftsman. That is so pretty! He is quite talented. The wooden container is beautiful! The cookies look great, too! I really like Lorna Doones, and that is what your cookies remind me of. I'll have to try your recipe out. How talented is your husband!!! I love it!! Gorgeous bowl and the cookies look great too. Wish my husband would take up a hobby like that!! I'm beyond impressed with your husband's talent for wood turning and your talent for cooking/baking. 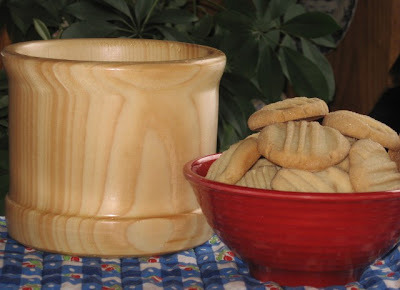 I'm speechless as I gaze at the cookies and wooden cannister -- they look like they were made for each other! The cannister and the cookies are the same color and comprise the same lines. WOW! I would LOVE to have that cannister filled, to the brim, with your shortbread meltaways. OMGoodness. It's after 2:30 AM and I'm delightfully LOST in your blog.